Afternoon Tea is a guilty pleasure of mine. They have me at scones and clotted cream. Plus all the dainty sweets accompanied by specially brewed tea and there goes the weekend and the diet plan. I'm sure you've had that guilt creep up on you after one of those indulgent sessions, plus that lethargy after the sugar rush! Well, now you can have your cake and eat it sinlessly. 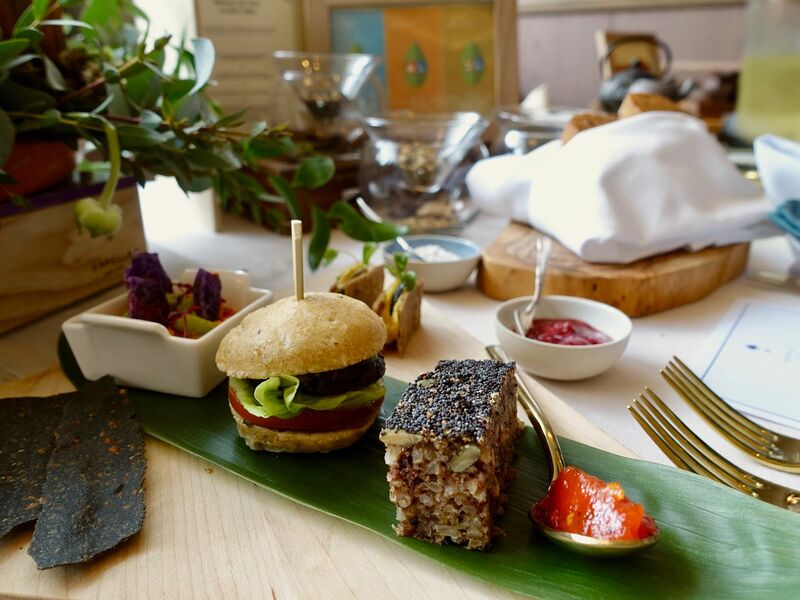 Capella Singapore's designer kitchen, Chef's Table has added a healthier option to its Capella Tea Experience – Wellness Tea Time, which is available every Friday afternoon from 3 to 5pm. 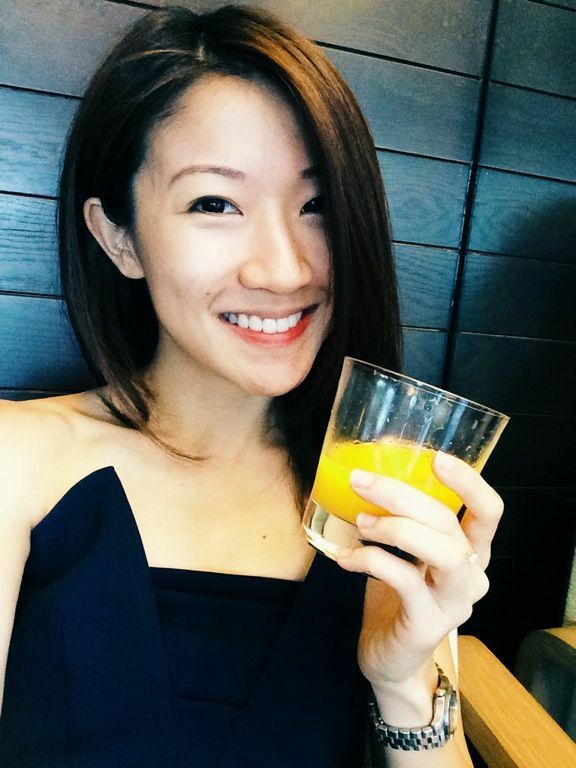 The menu is conceptualised by Chef Sandra Lim of Live Fruitfully, a certified raw food chef, and Chef David Senia, the Culinary Director of Capella Singapore, and together they have produced a unique five-course menu of gluten-free, dairy-free, and refined sugar-free sweets. Savories before sweets. 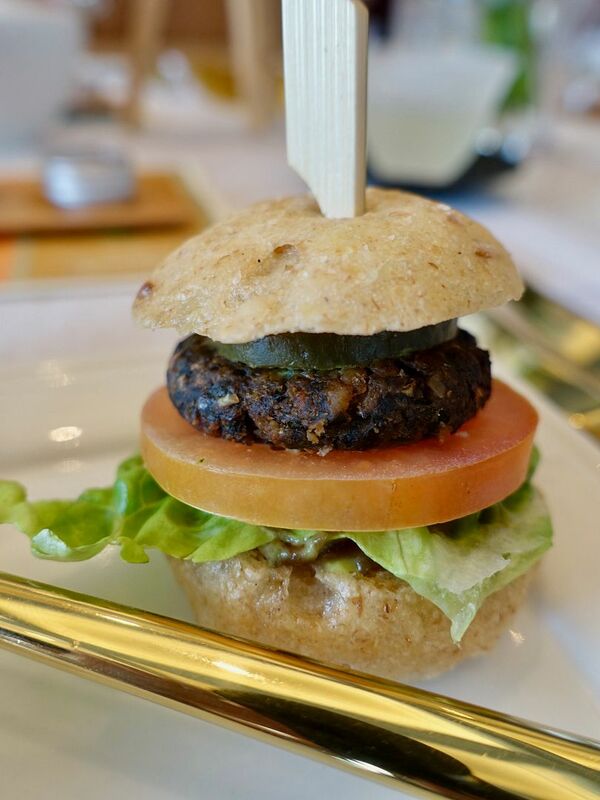 The Tempeh portobello slider with green goddess cream is full of 'meaty' flavors and textures. 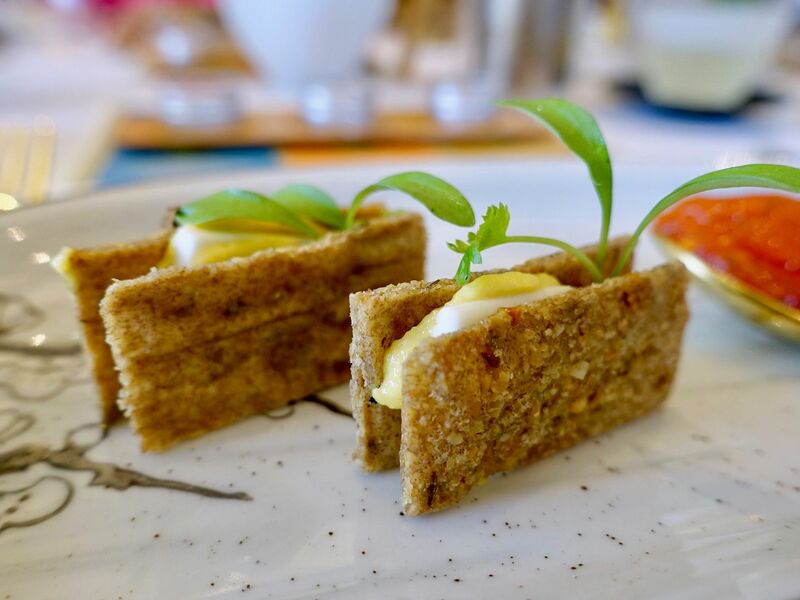 This tempeh was certainly more enjoyable than the Nasi Padang stereotype and we love the herby coconut yogurt cream and onion chutney that were layered in the mini burger. 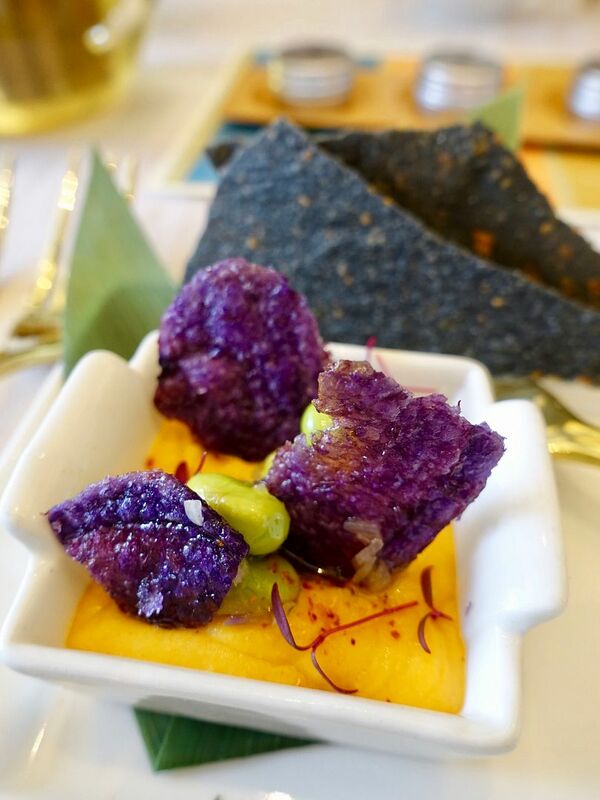 Instead of the usual burger and fries combination, we had a Crispy charcoal tuile with a sweet potato hummus. The hummus was tangy and you can taste the light natural sweetness of the sweet potato. We were astonished by the number of ingredients that go into making the Cauliflower millefeuille with shiitake ‘bacon’. There were different grains/sprouts other than cauliflower that make up the cracker! Sandwiched in the middle is a smooth corn purée and dehydrated shiitake. The hours of labor of love were gone in 2 seconds, I could have a dozen of these easily! Then we had the Sprouted whole grain bread with tomato tapenade which is made from 5 different grains. 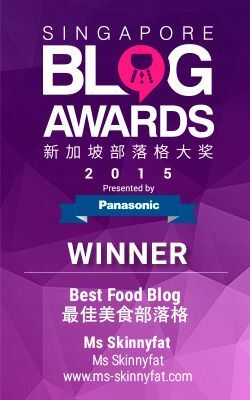 We were once again surprised by the airy texture and pockets of air within that mimicked bread. The grains were fermented in apple cider vinegar for 12h to the plant acid. The crunchy bread was perfectly complemented by the sweet and savory tomato tapenade. How do you make tasty scones without flour, butter, and eggs? Well you must certainly give these flat special house scones a try! They may not be airy or poufy like most scones but boy are they tasty! Made of almond flour and coconut flour, there's a lovely grainy texture to the scone, like desiccated coconut. Whipped coconut cream and a raspberry chia seed jam accompanied the scones, even though i felt there was no need for any added sweetness, but i couldn't stop slathering it with cream still! More sweets to follow, sweetened only by maple syrup and vegan chocolate chips. 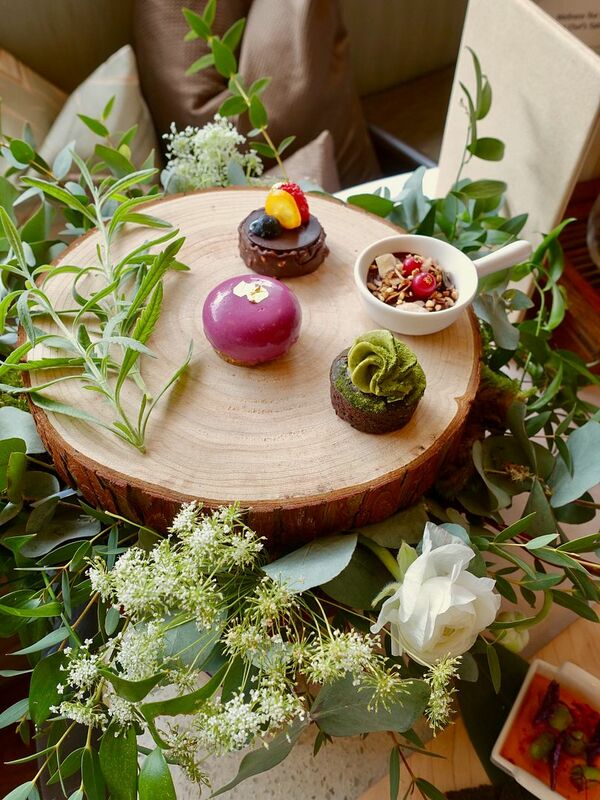 The colourful medley includes a creamy and tart Cultivated ‘cheesecake’ with blueberry and beetroot glaze that has been fermented using probiotics; a rich and crunchy Chocolate hazelnut dome (Jr's fav); Cacao avocado mousse that has christmasy spice in it; and a herby and dense Quinoa and zucchini chocolate tea cake. 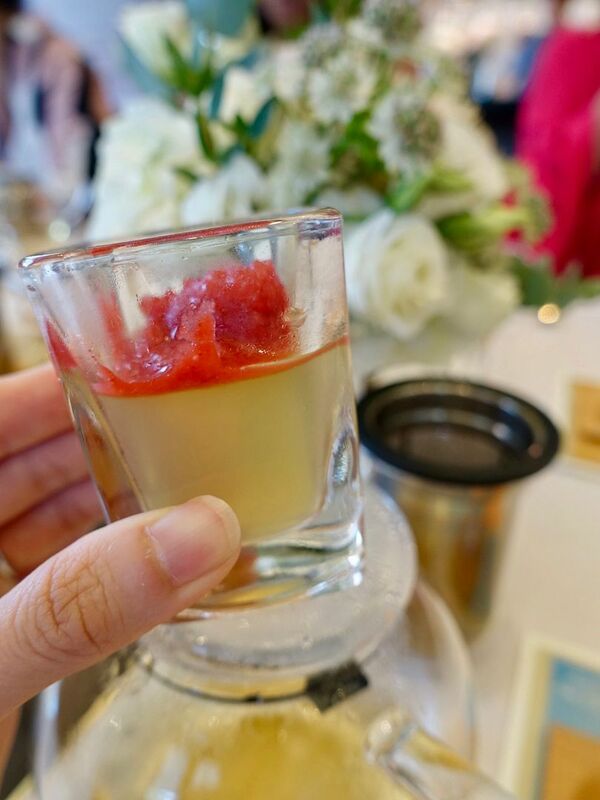 The tea time experience concludes with a refreshing Tomato consomme jelly with basil granita. 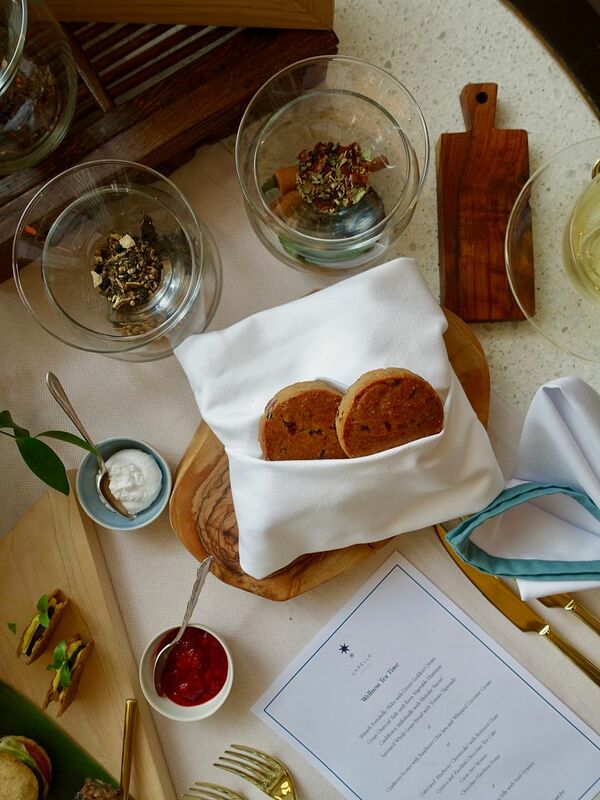 To further complete the afternoon tea indulgence, diners can take a pick from the three fine Ronnefeldt Ayurvedic teas – a cocoa-rich taste with light floral notes Stay in Balance; an invigorating herbal Light My Flame (this has ginger in it) or the smooth green tea blend Let It Go. 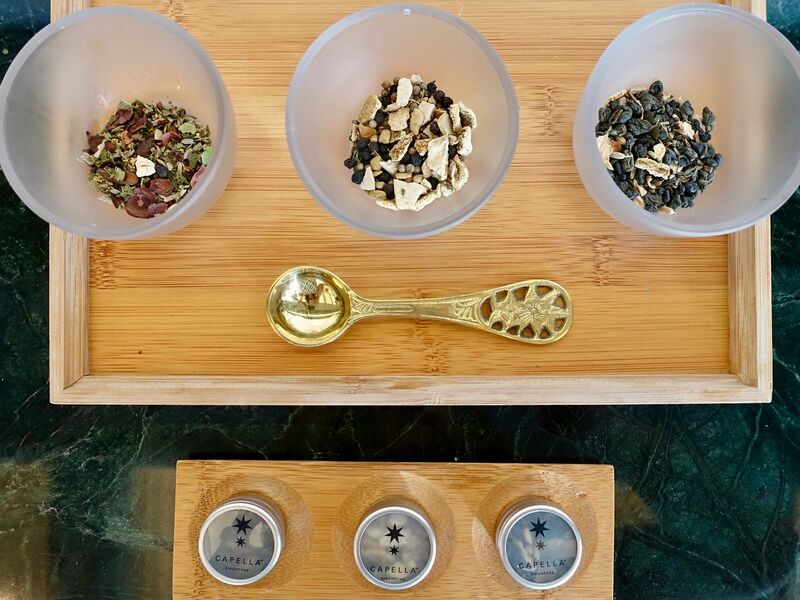 The Wellness Tea at Capella Singapore Chef's Table is priced at $59/pax. If you are up for a pampering treat, you may wanna check out the special spa package every Friday. at Auriga Spa. 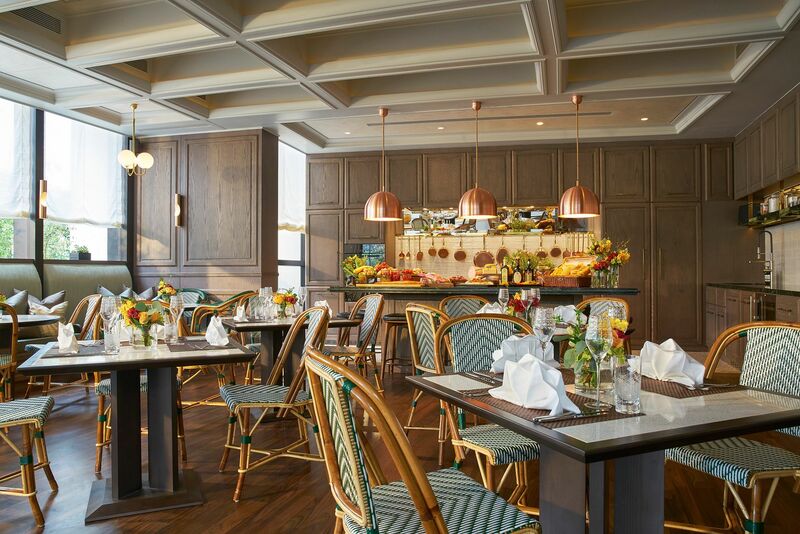 For $265, you will enjoy a minute De-stress Back, Face & Scalp Treatment, and a Wellness Tea Time at Chef’s Table.